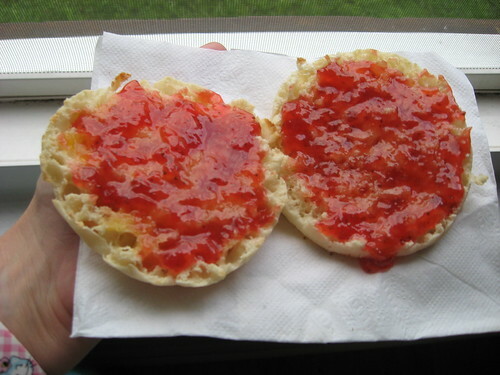 I have had some Strawberry Jam 2 mornings in a row 🙂 So Good! 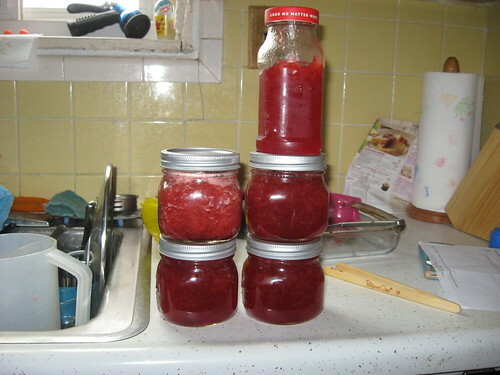 This was my first time making Jam and i got nervous a few times. I really did prepare for it well or use the best utensils i cold have. But let’s start at the beginning. My grandma makes jam every year and the past couple years she has been telling me i should try but it just seemed way to hard. Like everything had to be so exact and if it wasn’t you were screwed Lol. But this year i decided to try it. For about a week i have been looking at Mason Jars and the different brands and forms of pectins that they had at my local grocer. i finally just decided on the regular Sure-Jell. I got these mason jars mainly because i didnt want to get one of the packs of 20 i didn’t need that many. I knew i might be cutting it close with getting all the jam into them but i had some old jars at home from salsa and stuff and thats acutally just what my grandma uses so i figured if i had to i could use one of those and i would make sure i ate from that first. I got three 2lb packages of strawberries becuase they were on sale and the Sure-Jell said i would need around 5 lbs to make 5 cups of crushed strawberries. So I come home and started getting everything ready for making jam-cleaning the counter, getting a big pot to put the jars in because you have you “cook” them while you make you mixture. It makes the glass hot and keep it from cracking when you put the hot jam mixture in and it sterlizes them as well. The pot is covered with a lid but i took it off for the picture. I probably should have used a bigger pot but it worked for what i needed it to do. Then i realized i had forgotten lemons. So we went back to the store for lemons. After we got back i started cutting the leafy tops off the strawberries and put them in a big glass bowl to mash. I used a potato masher because in the Sure-Jell directions they stated this preserved the strawberries natural pectins better than if you used a mixer. here is a shot of it cooking and you can see the foam on the top. The foam isnt a big deal you can spoon it off if you want. i did spon some of it off but its hard to get it all. You can put a teaspoon of butter in at the beginning to deter the foam a little but i didn’t. i didnt think it would be a big deal and it wasn’t. After it boils you take it off the heat and put in 7 cups of sugar!!! and Bring it to a rolling boil again-You are supposed to let it boil for a couple mins but since i didnt use a big enough pot i had some trouble letting it boil that long because when its boiling it rises and i was close enough to the top of the pot as it was but i let it simmer and everything seemed fine. i then took the jars out of the pot one at a time so that they wouldn’t cool on the counter while i was filling another jar. Filling the jars was also a bit of a messy bit becuase i just spooned it over into the jar. But slow and steady did the trick for the most part. i realized at this point that my 4 jars wouldnt be enough so i pulled out a salsa jar and gave it a good rinse and put in the pot of cooking water to heat it up and sterilize it. and was able to put the rest of the mixture in that jar. Now the Ball mason jars have to be put back into a pot of boiling water for 10 mins to seal them up. I tried to put them back into the pot that i cooked the jars in when there were empty and it would have workd it the jars didnt need to be covered by about and inch of water so i tried to put as much water in and cover them and then put the lid on (dont ask why i just did) and as soon as i put the lid on tone of water overflowed onto my stove. Yes, yes deep inside i knew it would happen but i did it anyway becuase i didnt want to hunt down a bigger pot and really the next size up would have been a HUGE stock pot but in the end i had to go and get it anyway. And the bell jars happily coked away in there. Well again it tell you Rolling Boil but my water in the stock pot never came to a rolling boil and i let them cook much longer than the 10 mins it says hoping the water would start rolling. It didn’t and so i took my chances and just figured they really must be done by now. i let them sit the 5 mins and then took them out. The old salsa jar i did not boil because it does not have that seal that the mason jars do. so i did what my grandma told me she does (she always uses old jars she has around the house) and put the lid on turned the jar upside down for a little while and then turned it back the right way and left it on the counter to cool with the other jars. Sure-jell tells you it can take up to 24 hours for your stuff to fully set but whenever i walked by the jars i would pick them up to see if they were setting up yet. I also checked the lids to make sure when you pushed on them the didn’t move and happily all the lids were nice and hard, no up and down movement when i pushed on the middle of the lid-So they had sealed up perfectly even the old salsa jar. That really was my biggest worry-it meant i would have to repeat the whole boiling of the jars. If you look at the top left one you will notice it is a bit lighter than the others. That is just because thats the first jar i filled and so it has some of the foam that you get at the top. 2) 7 cups was a lot of sugar but the jam is not like super sweet so don’t let that scare you. That being said i think i still may like to try the Sure-Jell that is No Sugar Needed just to compare. My grandma is also sending me what she uses for her jam and i don’t think she uses as much sugar either-she buys some kind of sweetener packet. But again the jam is not overly sweet so don’t let the amount scare you. 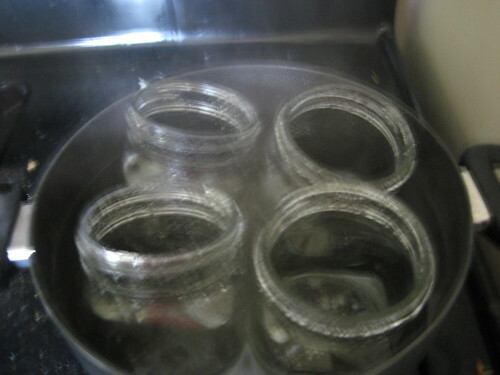 3) I used regular tongs-like ones you use for meat or cooking veggies and that worked fine for getting the empt jars but not so well at all when the jars were filled so i think next time i would get the special tongs you use to get the jars out of the hot water. in the end i just dumped enough hot water out so that i could reach in with a pot holder and get the jars and that worked with no problems. 4) Don’t be scared-there was a few times where i couldn’t meet the exact times or didn’t get the rolling boil or something just didn’t go according to exact directions. 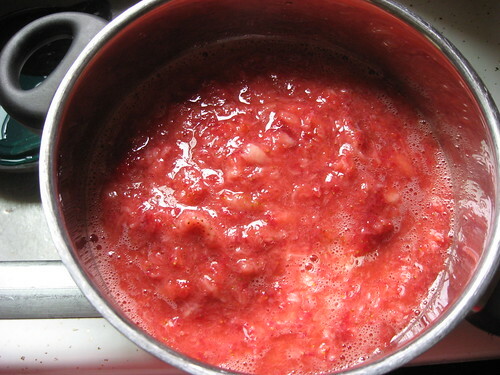 i had always heard making jam is so exact and i am not saying it isn’t but i messed up a few times and didn’t do things for the full length or boiled the jars longer but not at a rolling boil and in the end it still all worked out. Obviously the true test will be over the next few months when i get another jar from the basement if they are still good, but i am not so worried about that anymore. And you know what if it didnt seal the first time then you just have to do the 10 minute boiling process over and that really isn’t so bad. 6) be patient-it takes awhile to get to the rolling boil, you think you are there but then you stick your spoon in and it slows down so youhave to wait a bit more. it took until the next morning for my jam to be set so just let it hang out. Now i am no expert and this was my first time making jam. 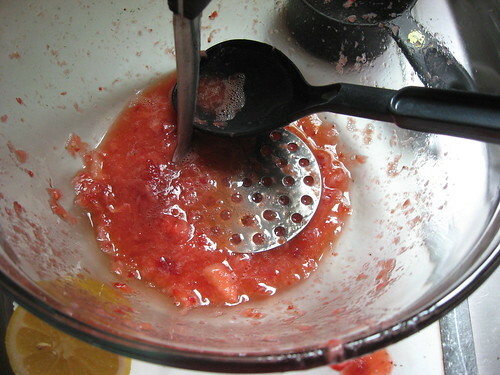 Different things work for different people but remember if you do decide to make Jam let it be fun not stressful. I was going to post the finished surprise i made for Little Man. i got it all done last night but since this has ended up being so long i will save it for tomorrow. Oh and in case your wondering i used just under 4 lbs of strawberries so i still have lots leftover. great post! 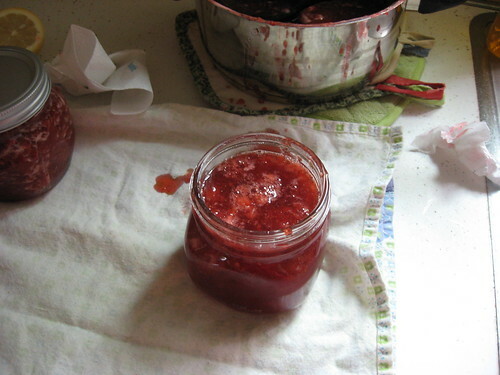 i’ve been thinking about making my own jam, too, and have been a bit intimidated by it…. reading about your experience with it has given me a little more confidence. thanks! Your jam looks absolutely delicious!! 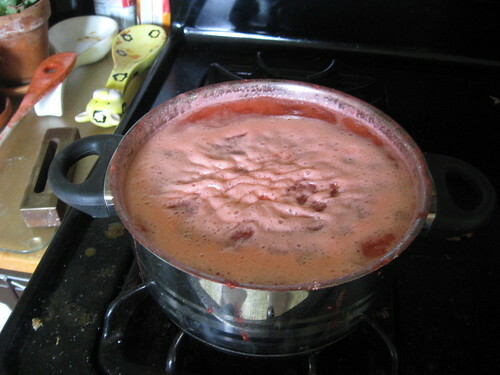 I made strawberry jam years ago but used the freezer method. It tasted so good but the jam didn’t set up very well. I will love to try myself ! Being wanting to try for a while but was thinking that was very hard and difficult kind of daunting. Now thanks to you I don’t think the same way anymore… thanks for the reminder that ‘it’s okay to mess up a little and try again’. I think I will try to make some before the end of this month ! If I do I will let you know how it went. Your jam looks super delicious! *^v^* And I love how you described the whole process, I’m going to make my own jam too, when the strawberries get cheaper. And that’s true – you don’t have to be scared with all the EXACT amounts and EXACT times, because our grandmothers made jams and pickles their own way without so much technology around.